Hey folks, this is le jester over here. I have been on hiatus on the blog for quite sometime. Its time I shall talk about this clan which which hypes everyone recently these few weeks. This clan just got revived when cocytus gets his reversed form and a new breakride. So lets first talk about the support that its getting. What are the combos and dropzone targets you can pull with this guy alone? [AUTO]:[Soul Blast (1)] When this unit is placed on (RC) from your drop zone, if you have a «Granblue» vanguard, you may pay the cost. If you do, draw a card. cost to replace your rearguards. with nightmist, ya get a decent 11k booster with her. 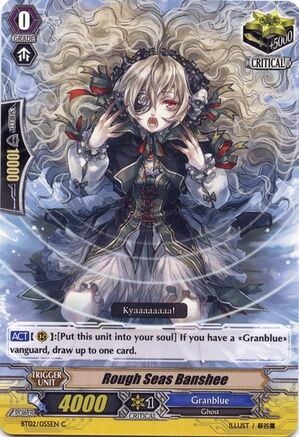 This card is so easy to abuse to draw cards and to pump your soul up to be used later for cards that burns the soul like the deadly nightmare, spirits and sea strolling banshee. 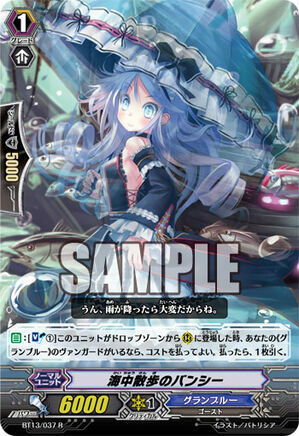 Wouldn't it be good to keep your opponent under the pressure cooker and if this card actually hits, you can replace a rearguard and keep it permanent on the field which in this case calling either the Sea Stroll banshee would give you the pluses. Yea why not some ruin shades to hit perfect numbers and hasten triggers. 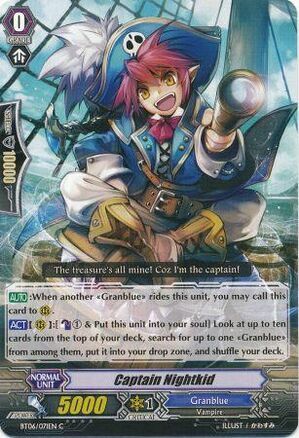 Or ya can actually call this guy to help thin and filter the deck by using the counterblast. Which granblue hardly uses it except for cocytus. Besides all this, what is the skill of cocytus reverse and how do I actually use it? 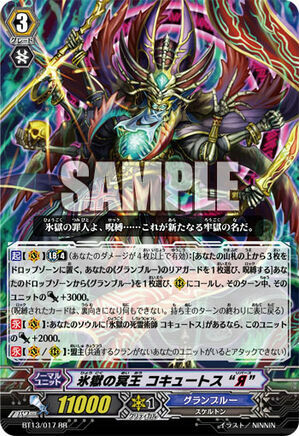 Ice Prison Hades Emperor, Cocytus "Reverse"
So who do I actually call with this effect? 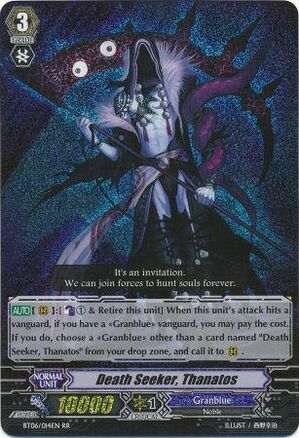 Answer is you don't just call a ruin shade or a banshee just because you can as wouldnt be advisable to get cards that draw from this effect either which will result to screwed up trigger stacks and decking out faster. As it would mean you decking out faster. In this scenario if you have a 7k booster without an attacker, Ya would want to call the 8k special intercepter to your Rearguard to become an 11k attacker with a 7k boost which makes it an 18k perfect number against crossrides. In another scenario is when you have a 10k vanilla as a rearguard. You would want to call back the 8k vanilla to your rearguard to make it an 11k booster which this turn makes the whole column a perfect number of 21k against the 11k base vanguard and the turn after a 18k base perfect number against crossrides. In this other scenario would be to respawn a ruin shade or a 7k booster or vice versa. With ruin shade, being notorious for milling 2 cards and hiting magic numbers of 11k. Just imagine ya mill with ruin shade which actually makes the whole column a magic number of 21k and a magic number of 19k agains crossrides without milling. This scenario is when you call a Sea strolling banshee to make it be a 9k booster. However ya would need a 9k attacking rearguard to make this column into a 18k perfect number against crossrides. This comes with a downside when the turn is over as banshee would be back to a 6k which makes it 15 column. I would say you have 2 choices. A. You would need to use ruin shade to mill to pump the column to 17k. B. You would need to replace the rearguard with a 7k booster to hit 16k magic number. However use either options depending on the situation you are in. 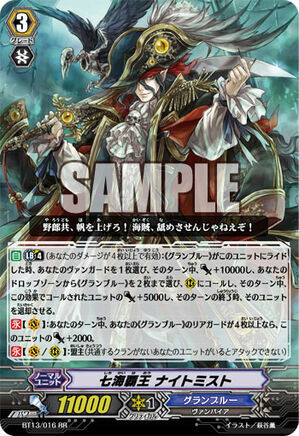 The last would be calling a rough sea banshee via cocytus Reverse's effect. In this case is when you are out of soul to burn and a Banshee would be a 7k booster. As mention above, 7k + 9k = Magic number. Similar to the situation above, he column will be imperfect for the next turn which would need you to send the banshee to soul to draw and call a 7k booster. You see cocytus reverse isn't designed like a garmore which gives massive pluses. What he is meant to do is like a deadly spirit and a nightmare which help correct your rearguards column to hit a perfect number and how can this get any better than a free mill and no counterblasts. Wouldn't this free up some counterblasts for a nightmist to revive himself? As the theme suggest of undeads and the sea, the deck is very volatile to situations and able to correct themsleves or refill the empty space like fluids and water. Its the deck that is able to give a massive advantage and pluses like a gold paladin deck. It also hasten triggers like a dark irregular, genesis, OTT which never guard a 1 pass against this deck or at times a 2 pass. Coz the triggers tend to stack well if you are running 12 critical triggers like me. 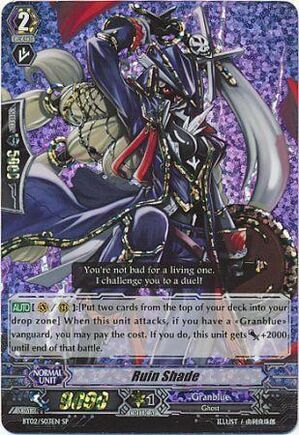 This deck is also able to recover from mass field nuking which a kagero and a narukami would do. The possible perfect counter?